It was that time of the year again and I had to think of a theme that would excite a bunch of five year olds and keep them entertained and busy. So many things to choose from but I thought this one would be a great old fashioned story that all little girls remember and love! I thought this theme would be great for my daughter’s 5th party. 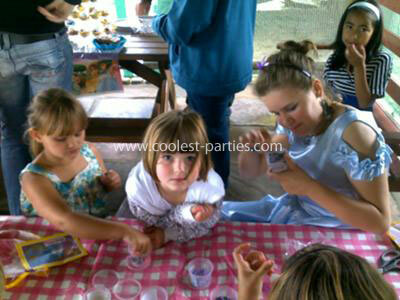 The cake is always the most exciting part of the party for kids. 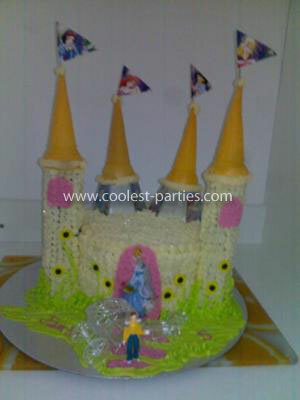 I made a Cinderella Castle cake, my first castle cake ever with Cinderella, the Prince and carriage. Used nice pretty pastel girly colours and had the flags with all the Disney Princesses on each flag. 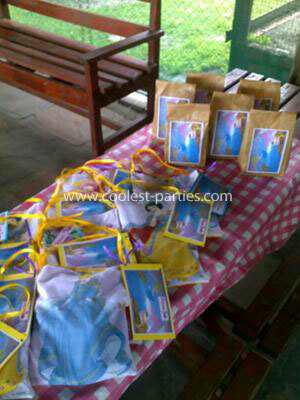 Party bags – Wanted something unique and different not the usual party boxes so I bought some fabric which had the Disney Princesses printed on them and cut out squares with each princess on and made little handbags to fill with sweets and party goodies. So each kid got to leave with a gift handbag. Every year I hire out an outfit depending on theme. 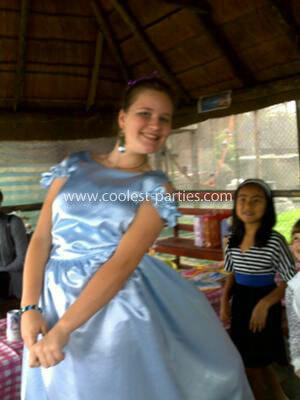 I hired a Cinderella outfit from a party shop and got my older niece to dress up and entertain the kids. 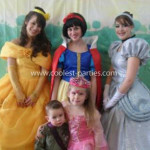 Relatively inexpensive if you can get a family member to dress up then you only pay for the hire of outfit. Always a hit with the kids. In the corner I made a little table with beads and goodies for the kids to make jewelery, like when the mice helped Cinderella to dress up and make her beautiful. This would be another gift the kids could take home to remember my daughters 5th party. 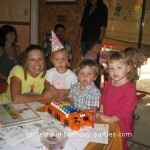 Party was definitely a hit and the kids all had much fun…..